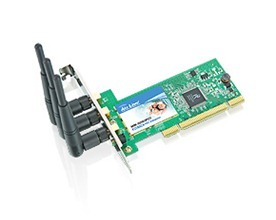 AirLive WN-5000PCI is a 300Mbps 802.11n wireless adapter with PCI interface that delivers extreme wireless performance to your home or office network. using the MIMO technology to provide ultra long range and wider wireless coverage. 802.11n Speed, Up to 6 times faster than wireless-G!